For this study, a trade linked global input-output table with environmental extensions has been constructed for the year 2000. The data comes from EXIOBASE, a highly detailed global IO database. The dataset includes 44 trade-linked countries/regions, which have been aggregated into four global regions: the EU; other developed countries; fast developing countries; and a Rest of the World. These regions are treated as internally homogeneous and the sector detail is around 129 sectors per country. A global final demand vector reflecting expected economic growth per region quantifies all sectors, resulting in the CO2 emissions of each sector in each region. These can be added into regional and global emissions and into emissions of regional consumption, reckoning with upstream emissions in other regions. On this basis three scenarios are constructed for the year 2050. The three scenarios include a Business-as-Usual (BAU) scenario, a Techno-Scenario (TS), and a Towards-2-Degrees Scenario. The overall outlook of the study is not optimistic. Its main conclusion is that reaching a 2-degrees target is possible only with deep changes in technology and deep changes in consumption and reduced growth levels. The use of low emission hydrogen and other low emission energy carriers is considered as an option that can contribute to reach the 2-degrees target. In addition, a more pervasive pressure towards emission reduction is required to generate substantial shifts in consumption patterns. However, the report comes to the conclusion that technological and behavioral changes alone cannot reduce carbon emissions sufficiently and that the 2-degrees target may only be reached by adding extreme reductions in economic growth. The reports acknowledges that a reduced growth scenario compatible with a 2 degrees target would be so drastic that it is not feasible and would persist the income differences between poor and rich countries. The scenario machine, including the basic data on the regions can be used freely and is downloadable without restrictions below or via the website of the Institute of Environmental Sciences (CML). The assumptions, on which the scenarios are build on, are specified in detail and can be varied easily. De Koning, Arjan; Huppes, Gjalt; Deetman, Sebastiaan. 2014. 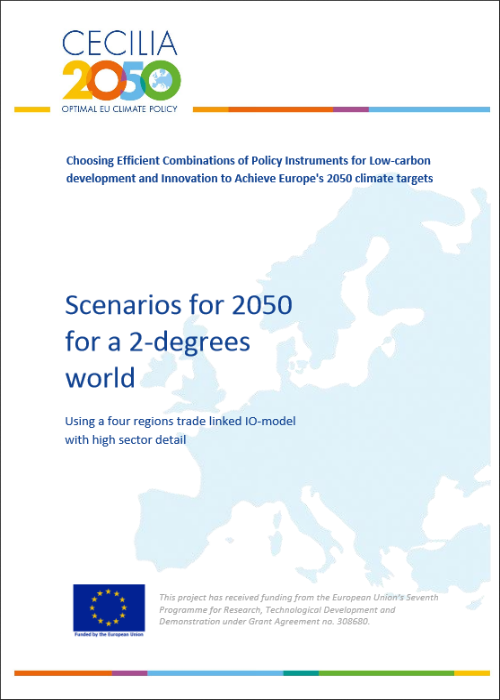 Scenarios for 2050 for a 2-degrees world: Using a four regions trade linked IO-model with high sector detail. CECILIA2050 WP3 Deliverable 3.2. Leiden: Institute of Environmental Sciences (CML), Leiden University.